I recently did a post on the current season of Survivor called Survivor 30 Being Annoyed and Abuse.In the post I talked about how mean spirited the season has ended up particularly centering around a woman named Shirin who was verbally assaulted by a fellow castmate named Will in a personal attack that hasn’t been seen on the show before. I was feeling pretty down but found something I could take away from all the conflict. I realized how I can rationalize doing hurtful things to people because their personality is annoying to me which really isn’t a good reason when you think about it. So I took something away from it and I am curious to see how it all ends (hope for Mike!). Luckily Survivor didn’t leave us all depressed with season 30 for long. 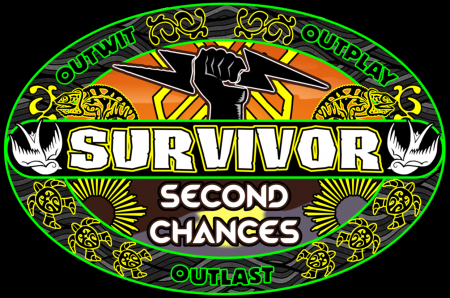 They announced season 31 is going to be called Survivor Second Chances and they are doing something they’ve never done before. They have nominated 32 players, 16 women, 16 men who have all played the game once before. Some of these are old time players from seasons 1 and 2 and others are from the current season 31 including Shirin (hurray!). 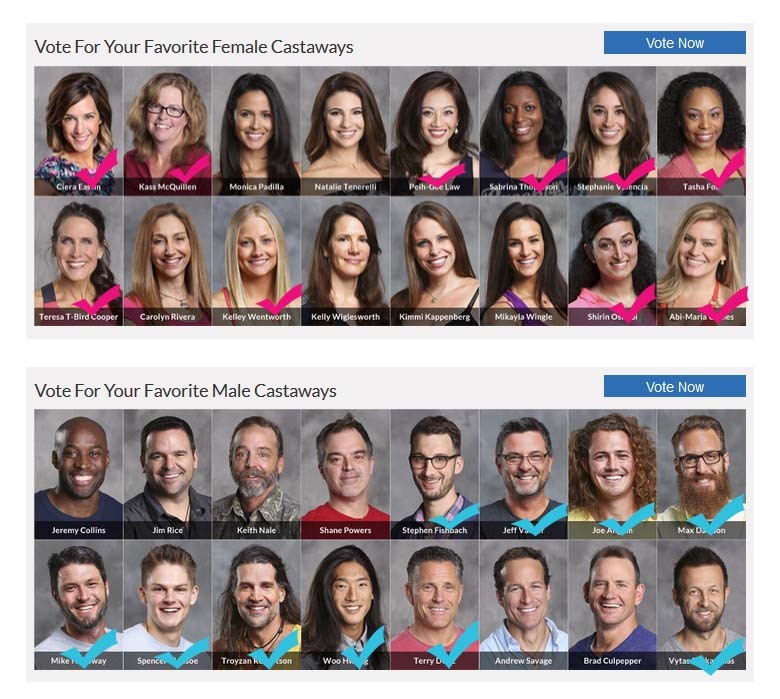 I’m so excited to see any of these 20 back again but it has been like Christmas for Survivor fans to hear the campaigning and try to decide what people to vote for. My favorite podcaster over at RHAP has been working overtime to interview as many of the contestants as possible and these are thorough 45 to an hour long interviews which again is like a holiday for fans. We get to hear all about their original seasons plus what they would do differently. We can even provide ideas and suggestions for the upcoming season something that has always been impossible (we usually don’t know the cast until it has already filmed!). So if you are fan of the show it has been a real treat. The graphic above shows the people I have decided to vote for. I looked at it as if I was a casting director and what mixture of personalities and types would I want on the show. That’s why I have some strong personalities like Troyzan and Abi, some thinkers like Spencer and Stephen, some challenge beasts like Terry and Tasha and some who will play with real heart like Kelly and Woo. The rest are just people that I like a lot and am curious to see what they do. Whoever gets picked it is going to be a ton of fun to see, as I don’t dislike any of them. I tried to pick people that I think will be positive while still being competitive. Even if there are some feisty one’s I think the one’s I picked keep it to the game and know it is all in good fun. If it is mean like this season and misogynistic I will be very sad. Let’s play hard but have a good time while in the game guys and girls! Are any of you voting? Who do you like? Please let me know! 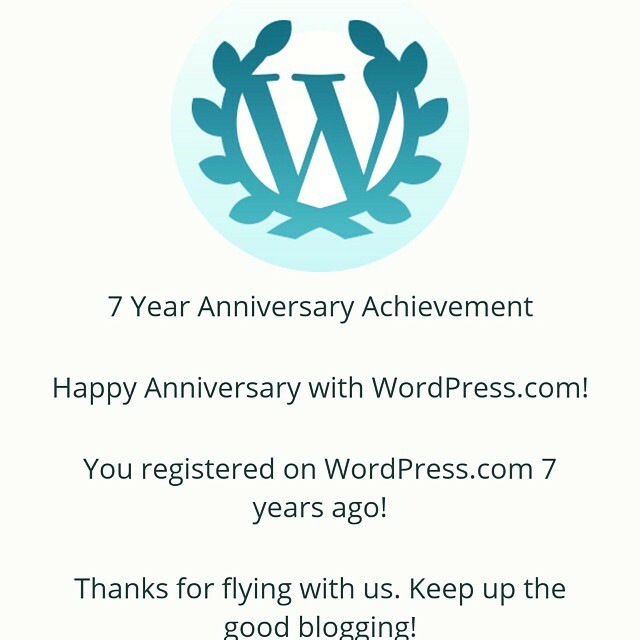 On a side note today is my 7 year blogiversary! That’s 7 years writing my silly thoughts about life. I should do something more important but I’m saving that for post 1,000 which is 2 posts away. Wow! I like that you are voting through the eyes of a casting director. On my post I just picked my favorite people haha. The only snub I am upset about with your list is Shane Powers. He is a crazy man who is also super honest and loyal to his alliance. Other than that I love it! Thanks for the comment and very excited to have found your blog! The thing with Shane is I just felt like he had an entitled Frankie Grande kind of attitude like the world owed him this. That bugged me. And him making Rob do a special nonpodcast was very divaish. I felt like I had enough characters that would provide drama and honestly after this season I want drama but enough with the jerks. But there’s really nobody I hate so it’s tough. That’s fair! And my respect just went up for you now that I know you listen to RHAP! What’d you think about tonight’s episode?